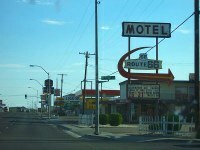 Kingman is a nostalgic tourist destination in Arizona. Located in the northeastern corner of the state, between the Grand Canyon and Las Vegas, the city is a popular fuelling stop between the two destinations; however, Kingman is most famous for having been a major stop along the celebrated Route 66. There are a few old buildings and museums dedicated to this era, including the aptly named Route 66 Museum, and though most of the road has been replaced by Interstate I-40, the longest remaining stretch runs from Kingman to Ash Fork. There are some good restaurants and bars in Kingman and wonderful hiking can be enjoyed in the area.